I love birds. Especially birds with interesting coloring. I saw a blue and reddish streak fly by me yesterday as I was walking on the edge of the lake. It seemed about to land, but I lost sight of it as it passed some tall reeds. I continued slowly and discovered the bird standing on a half-submerged log. I got my phone out and froze in place. The heron didn’t seem to mind me, as it placed one foot slowly in front of the other, sneaking up on tiny water disturbances. The shot below shows the heron leaning on one leg just before striking the water with its beak. 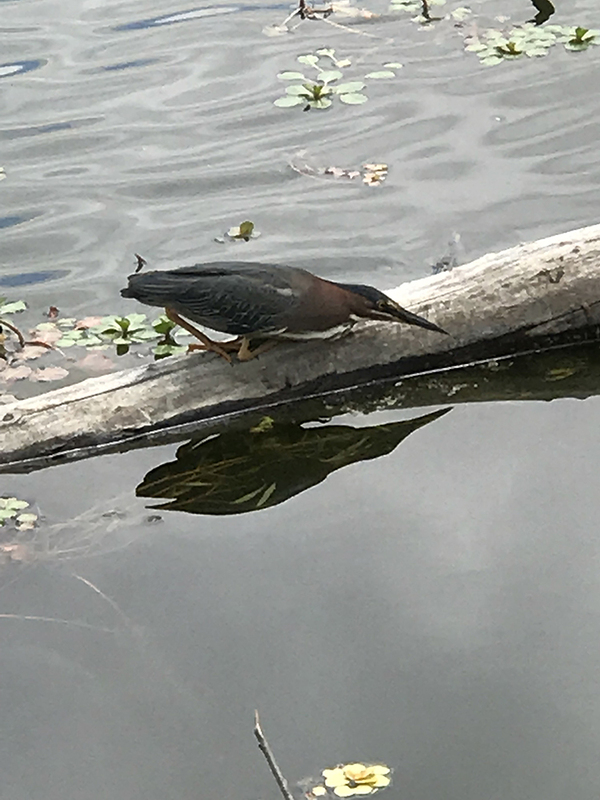 This entry was posted in Personal Stories and tagged art, birds, birdwatching, daily constitutional, green heron, heron, photography, street photography, visual art, wildlife. Bookmark the permalink.